I've always liked what DuClaw had to offer, but some time during the past year my appreciation for what they do has grown considerably. Nearly every beer I try of theirs is something to behold. Each time I try a something new from DuClaw I find myself enjoying beer that has big flavor but is also extremely well rounded. A few months ago while doing my winter seasonal bottle shopping I happened across a bottle of X-1. Being that this beer took a medal at the World Beer Cup it's a beer that I've wanted to try for quite some time. Yesterday, after forgetting that I had this bad boy sitting in the basement I was finally able to sit down and enjoy the X-1. Appearance: X-1 pours pitch black and is topped off with a fairly substantial head that was bread like in its texture and chocolaty in color. I don't know what it is, but anytime a beer has a head with a color different than the usual white/off-white color it makes it look all the more inviting to me. Nose: The aroma on this one is great. There are big chocolate notes on top with roasted coffee underneath it all. I'm not always a fan of chocolate and beer but in conjunction with the roasted malt the aroma on X-1 totally won me over. 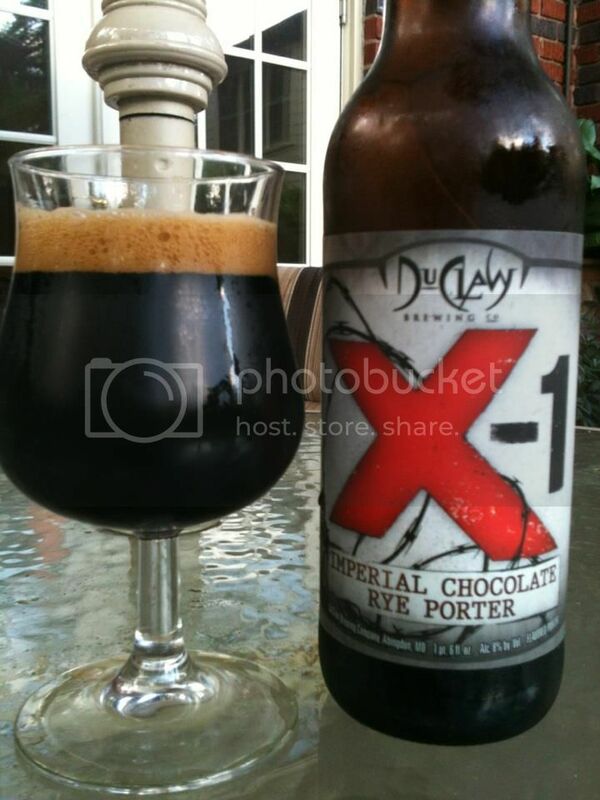 Taste: DuClaw X-1 could very well be not only the best chocolate beer I've ever had, but also the best porter. A lot of what you smell is what you taste, but I was happy to learn that chocolate presence was more subdued than the aroma had me anticipating. That's not to say the chocolate flavor isn't a major player. It is....it's just not the be all end all of this beer. The sweet chocolate notes are balanced perfectly by the bitter roasted coffee flavors you get on the finish. Final Verdict: Like I said on my Untappd check-in last night, what a f'n beer. It truly is delicious. When it comes to Porters and sweeter/maltier beers I often find it a challenge to drink more than one beer at a sitting. By the time I get through the sweet flavors I've worn my palate out and I'm ready for something else. With X-1, I don't see myself having that problem. This is perfectly balanced beer that is worthy of any accolades it's received. If you see this one on the shelf or hear about it being offered on tap, do not hesitate to seek this one out. DuClaw X-1 is a great beer.